The first Premier League weekend of 2019 provided everything from crucial own goals in the relegation battle to another Liverpool clean sheet in the title race. Manchester United avenged an early-season defeat by Tottenham with victory at Wembley, while Mohamed Salah continued to buck a penalty trend and David Luiz’s creative streak shone through once again. Here are the best stats from the weekend. A swift Manchester United counter attack, finished by Marcus Rashford, saw Solskjaer’s men overcome title-chasing Tottenham 1-0 at Wembley. 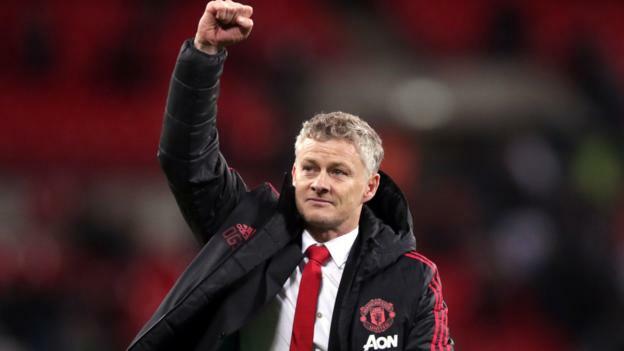 The result ensured the Norwegian equalled Sir Matt Busby’s record of winning his first five league games in charge of the club – although Solskjaer’s record stands at six consecutive victories, having beaten Reading in the FA Cup third round during that run. Marcus Rashford has scored in three consecutive Premier League games for the first time in his career. Paul Pogba has been directly involved in 53% of United’s 15 Premier League goals since Solskjaer took charge (four goals, four assists). David de Gea made 11 saves in Sunday’s match for United – only against Arsenal in December 2017 has he made more in a Premier League match (14). This was also the most saves he’s made in a top-flight league game while also keeping a clean sheet. Questions had been raised about the level of United’s opponents during Solskjaer’s reign, but he passed his test at Wembley with flying colours. United are now six points behind fourth-placed Chelsea, and if they can maintain their momentum, they could even book their place in next season’s Champions League despite a difficult first half of the season. While defending is his main responsibility, Chelsea’s Brazilian centre-back David Luiz is renowned for his ball-playing ability when his side are in possession. The 31-year-old was influential in the Blues’ opener against Newcastle on Saturday as the defender floated the ball into Pedro’s path, for the Spaniard to nonchalantly control and finish over the onrushing Martin Dubravka. Luiz’s latest assist follows his pinpoint pass to N’Golo Kante to strike the winner against Crystal Palace in the Blues’ last away game of 2018. Remarkably, the Brazil international has played 31 through balls in the Premier League this season – more than double the total of any other player. Luiz must be a fan of the L1+triangle combination when he is controlling himself on Fifa 19. Burnley achieved an impressive feat in their crucial relegation battle with Fulham at Turf Moor, claiming all three points without registering a shot on target. The Cottagers had taken the lead with a stunning Andre Schurrle strike, but two own goals in three minutes saw Sean Dyche’s side take the win. Joe Bryan and Denis Odoi both diverted the ball into their own net as the Clarets became the first side to win in the Premier League without a shot on target since Crystal Palace beat Watford in March 2017. Burnley are also the first top-flight side to score two goals without producing a shot on target since Opta began keeping such records in August 2003. Claudio Ranieri’s Fulham are the first side to score at least two own goals in the first half of a Premier League match since Everton did so against Southampton in April 2014. The Italian, understandably, is keen to add defensive reinforcements in January to boost his side’s chances of survival. Mohamed Salah’s decisive penalty saw Liverpool open up a seven-point gap at the top of the Premier League. The Egyptian stepped up to smash the ball past David Button with a confident strike – and the stats suggest it was never in doubt. Of the last 10 penalties taken by a left-footer in the Premier League, six have been missed and four have been scored – with Salah being responsible for all four that have been converted. Jurgen Klopp’s men, who kept their 13th Premier League clean sheet of the season, have conceded just 10 goals in 22 matches in the top flight. Only Chelsea in 2004-05 (eight goals) have conceded fewer after 22 matches of a Premier League campaign. It looks set to be a two-horse title race between Liverpool and Manchester City, but a steely determination at the back will certainly help Klopp’s men. Was the writing on the wall in South Wales? Huddersfield’s visit to Cardiff City ended goalless – but did the numbers suggest beforehand that might happen? The visitors travelled to the Welsh capital as the division’s lowest scorers (13), having failed to find the net in 50% of their matches. Only they and Newcastle had managed fewer league goals than Cardiff (19). However, it was Huddersfield who posed a greater threat in front of goal. David Wagner’s side had 14 efforts, while the hosts had as many players booked as they managed shots – three. Cardiff had the first shot of the match after just 29 seconds, but they had to wait until the 70th minute for their next. The reverse fixture between these two in August also ended goalless. Should both teams stay in the Premier League, it may not be the first match fans circle on the calendar when next season’s fixtures are released.